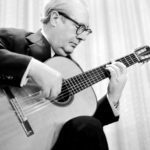 Andrés Segovia Torres known as Andres Segovia, was a virtuoso Spanish classical guitarist from Linares, Spain. He is regarded as one of the greatest guitarists of all time and the grandfather of the classical guitar. Many professional classical guitarists today are students of Segovia, or students of his students. "Lean your body forward slightly to support the guitar against your chest, for the poetry of the music should resound in your heart." "The advice I am giving always to all my students is above all to study the music profoundly… music is like the ocean, and the instruments are little or bigger islands, very beautiful for the flowers and trees."